I am so happy to be participating in my second Daring Bakers challenge. I have to tell you that I had my doubts about pulling this one off. It’s been such a hectic month for me and even though I swore I wouldn’t put another challenge off to the last minute, the end of the month crept up faster than I realized. But this month’s recipe featured my all-time favorite dessert ingredient…CARAMEL! So I just couldn’t bring myself to skip it. 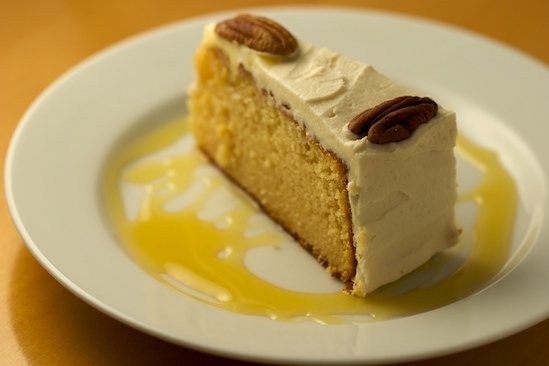 This month’s challenge is a Caramel Cake with Caramelized Butter Frosting courtesy of Shuna Fish Lydon, as published on Bay Area Bites. The co-hosts for this month’s Daring Bakers Challenge are Dolores of Culinary Curiosity, Jenny of Foray into Food, and Alex of Blondie and Brownie. Natalie from Gluten-a-Go-Go assisted with making gluten-free changes to the original recipe this month. Although I love to eat just about anything with caramel, I’ve only made it from scratch a couple of times. I’m certainly not a caramel expert, and with my time crunch this month, I only had one shot to get this cake done right. Talk about pressure! Luckily, Shuna took the time to answer all of our questions and gave us tons of guidance on this challenge. Since I waited so long to make it, I was able to read about some of the problems others had experienced and I had the benefit of reading Shuna’s answers to questions that I probably would have asked if I had attempted the cake earlier in the month. The cake was a little time consuming, but it came together beautifully. The caramelized butter frosting has an amazing flavor but it’s definitely sweeter than I normally like. At first I thought that the cake with the frosting was just too sweet for me and I was a little disappointed. But by the second day, I had completely fallen in love with it and ate two slices before sending the rest with my husband to work. It got rave reviews from everyone who tried it. The cake and frosting compliment each other beautifully, the trick is to use only a thin layer of frosting so that the sweetness isn’t overwhelming. I’ve decided that I will make this cake again in the future but will make a smaller amount of frosting and will frost only the top of the cake. I think the frosting would also be great for cupcakes if used sparingly. All in all, this was a great challenge and I can’t wait to see what we’ll be working on next month! Be sure to check out the Daring Bakers Blogroll to see who else is participating! Lovely! I liked it better the second day too, which is why I halved and hoarded it :) Yours is simply beautiful. Beautiful! I used extra salt in the frosting and fell immediately in love with it. I also think it would be perfect for cupcakes. I am so glad that you found the time to do this. Your cake turned out beautifully. It was so delicious wasn't it? Oh how pretty with the pecans on top. I'm sure all your husband's colleagues enjoyed it immensely. This looks delicious! I'm a sucker for caramel as well, but I'd definitely have to agree with the other Elle and add some salt to the frosting. Salted butter caramel frosting? Wonderful. Love how your cake turned out. It is absolutely yummy and beautiful. What a pretty cake you've made! I love you used pecans with all that caramel! Have I mentioned how happy I am that you're in the group??? Gorgeous...gorgeous...gorgeous! What a beautiful cake! I want a piece now, think you can mail me a slice???? LOL! 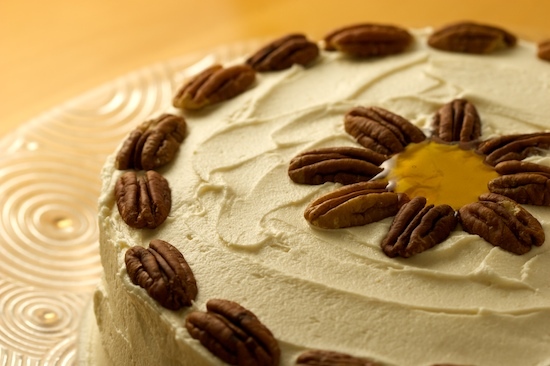 Pecans on top is a great idea! Looks gorgeous! Your cake turned out so beautifully! Looks delicious! That cake is so cute! I love the daisy design! That looks so good. Yum! That's a beautiful cake! Hummm, I'm a itching to get into the kitchen now - but one question. Is it 2 eggs? The recipe says "2 each eggs". And btw - HAPPY BIRTHDAY! Beautiful cake! This cake really did taste better the next day! Nice job! Thanks, everyone! I just got home from our Thanksgiving trip so haven't had a chance to go check out all the other Daring Bakers' posts yet. I forgot to mention that I did add sea salt to the frosting and it really enhanced the flavor! It was still very sweet but absolutely delicious in small amounts! To answer Katrina's question, yes the recipe requires two eggs. I copied/pasted the recipe from the original source so that's why it sounds different than usual. I'll go in and edit it to avoid any more confusion. Again, thanks for all the feedback, it was really fun to make! We have one piece left...Your cake turned out beautifully! Classic & Elegant. I try to send my baked goods to my husband's office, but they're always on diets and don't like the temptation. Oh well. I added quite a bit of salt to the frosting, too -- and more caramel. That seems to have helped with the sweetness -- but deliciious! Welcome back home. That looks tasty, and a cake that has to be tried. I love how your cake looks! It was a really good cake recipe and the browned butter was so interesting as a frosting. Can't wait for the next challenge! Lovely top to your cake! WIsh I had seen it for inspiration for my own. Great job! Great looking cake. I love the pecan "flower" in the center. I ended up adding a bit extra sea salt to cut the sweetness in the cake and that worked well for us. 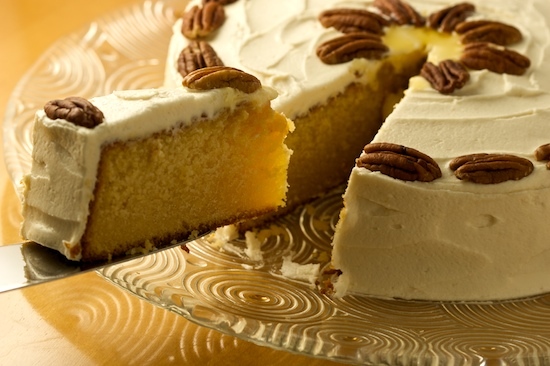 I really loved the browned butter flavor and thought it went well with the caramel cake. Beautiful! gorgeous!! makes me wish i would have been patient enough to bake the next morning with good sunlight for the pics...oh well. your cake is beautiful. bravo! What a gorgeous cake...well done on your second challenge. Yes, the cake certainly grows on you, doesn't it. I fell in love with the frosting...totally addictive!! Great job on the second challenge... I agree that the cake grew on me. At first I wasn't sure if I really liked it but the next day it tasted even better. I did use the icing very sparingly though. Your cake turned out beautifully! I too had super-ultra time crunch this month - only I didn't get the cake made :( Amazingly, what I was envisioning was very similar to yours, simple with toasted pecans and caramel on top! I've been looking for a caramel cake recipe. This looks like it. I agree, the frosting was very sweet, I should have used less myself. Your cake looks fabulous. Well done. My mouth was literally watering as I read through this post. I actually thought my wife was in the kitchen baking because I could totally smell this cake. I wish my mind wouldn't do that to me, now I'll be craving this until I make it. Your cake looks great! I love the texture - it almost looks like a pound cake. This does seem to be one of those recipes that gets better with age. I'm glad you AND your husband's colleagues enjoyed it. Thanks for baking with us. This sounds delicious. I wonder why I haven't come across this site any sooner. Try using heavy cream instead of water in your caramel sauce. It comes out delicious! (Make sure to warm the cream slightly before adding to prevent so much splashing).